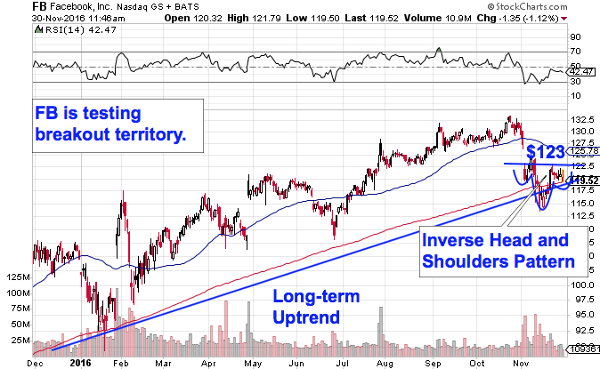 Here's a technical look on how to trade some of the most active stocks on the market today. Put down the 10-K filings and the stock screeners. It's time to take a break from the traditional methods of generating investment ideas. Instead, let the crowd do it for you. From hedge funds to individual investors, scores of market participants are turning to social media to figure out which stocks are worth watching. It's a concept that's known as "crowdsourcing," and it uses the masses to identify emerging trends in the market. Crowdsourcing has long been a popular tool for the advertising industry, but it also makes a lot of sense as an investment tool. After all, the market is completely driven by supply and demand, so it can be valuable to see what names are trending among the crowd. While some fund managers are already trying to leverage social media resources like Twitter to find algorithmic trading opportunities, for most investors, crowdsourcing works best as a starting point in analysis. So, today, we'll leverage the power of the crowd to take a look at some of the most active stocks on the market. The United States Oil Fund (USO - Get Report) has long been investors' simplest way to get exposure to crude oil prices -- and on Wednesday, this big ETF is exploding higher, up more than 8.6%, following the results of the meeting of the Organization of the Petroleum Exporting Countries in Vienna. OPEC agreed to cut oil output for the first time since 2008, spurring a push in Brent crude oil above $50. 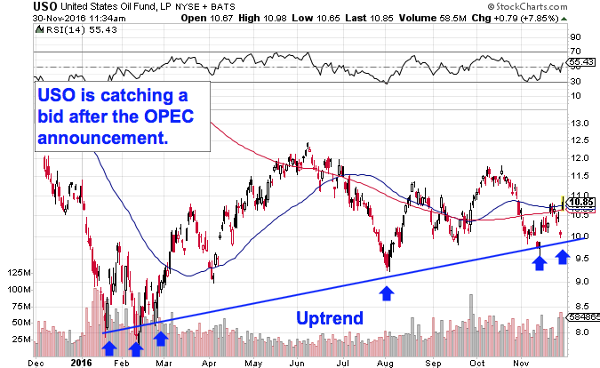 With the 2016 oil uptrend still very much intact this fall, this latest pop higher looks like a low-risk buying opportunity in USO. Not surprisingly, today's big move higher in oil prices is showing itself to an even bigger degree in the individual energy stocks. One of the biggest-volume movers is Chesapeake Energy (CHK - Get Report) , a stock that's rallying 10.5% higher Wednesday afternoon on the higher prices for energy commodities. For a variety of reasons, energy producers effectively act like leveraged bets on energy prices, and that's spurring the outsized price move in shares of Chesapeake today. 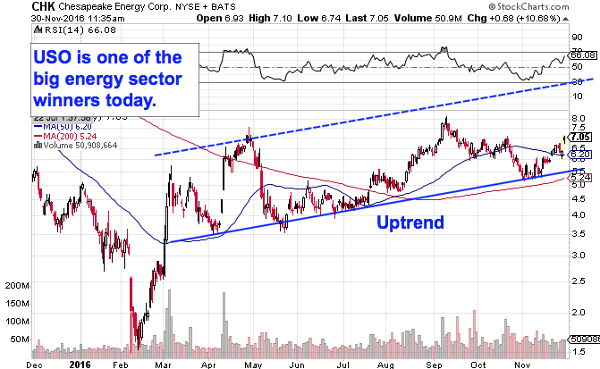 From a technical standpoint, Chesapeake's up-move makes sense in the context of its long-term uptrend. 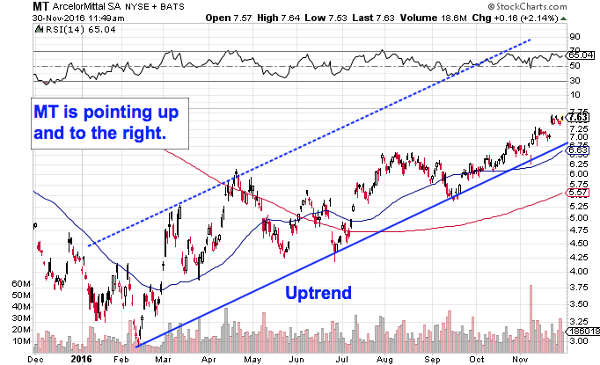 Shares have been holding onto higher lows since April, and they're continuing to trend higher from here. If you're looking for a buying opportunity here in Chesapeake, it makes sense to park a protective stop on the other side of the 200-day moving average. Marathon Oil (MRO - Get Report) is breaking out this afternoon, rallying more than 22% on the heels of the OPEC meeting and higher crude prices. Marathon has been forming a long-term ascending triangle pattern for the last several months, signaling a potential breakout move on a push through long-term resistance at $17. Sure enough, shares are managing to crack that price ceiling on Wednesday. That key price move means Marathon is likely to keep on outperforming in the final stretch of 2016. Shares of American Eagle Outfitters (AEO - Get Report) are getting pummeled this afternoon, down more than 14% on huge volume following the firm's third-quarter earnings results. American Eagle actually met earnings estimates for the quarter, bringing in a profit of 41 cents per share. But guidance for the critical holiday fourth quarter missed estimates, as the firm reported an earnings forecast of between 37 and 39 cents per share. Analysts were expecting a 45-cent profit. Technically speaking, American Eagle is down but not quite out. Shares are testing a key support level at $16 on Wednesday afternoon, a line in the sand that, if crossed, opens up this stock to a lot more downside risk below. That said, $16 is still holding as a price floor at this point, and until that changes, shareholders shouldn't panic just yet. Year to date, American Eagle is holding onto 5.3% gains. Valeant Pharmaceuticals (VRX is getting sold off by almost 9% on Wednesday, dropping following reports that talks to sell the firm's gastrointestinal drug unit, Salix, to Takeda Pharmaceutical (TKPYY had fallen apart. Investors had been looking at the sale of Salix as a welcome source of liquidity on the tail-end of a very challenging year for shareholders. So far, Valeant has lost almost 85% of its market value since the calendar flipped to January. 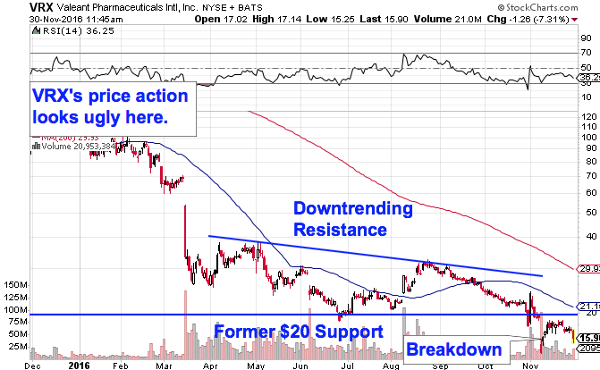 Any way you slice it, Valeant's price action looks ugly here. Shares violated a key support level at $20 earlier this month, and they're continuing to see meaningful downside risk ahead. 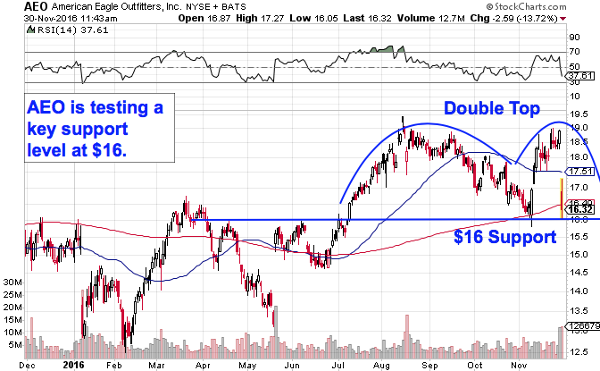 Bargain-hunters should avoid Valeant until this stock can start establishing some higher highs. Sellers are clearly dominating the price action this fall. It's been a solid year so far for shares of $342 billion social media stock Facebook (FB - Get Report) . Year to date, Facebook, an Action Alerts PLUS holding, is up more than 13%, leaving the rest of the S&P 500 in its dust. And while shares are down 1.9% on high volume this afternoon, the good news for shareholders is that Facebook is actually showing a bullish technical trajectory. Shares are forming a near-term inverse head-and-shoulders pattern that coincides with trendline support, signaling a reversal on a move through nearby resistance at $123. If you're looking for a buying opportunity in Facebook this fall, a break through $123 is the confirmation that buyers are back in control of shares. The rally in oil prices is spilling over into other hard commodities, namely steel. ArcelorMittal (MT - Get Report) is up just under 2% on big volume, adding to an uptrend that's sent shares 80% higher so far in 2016. 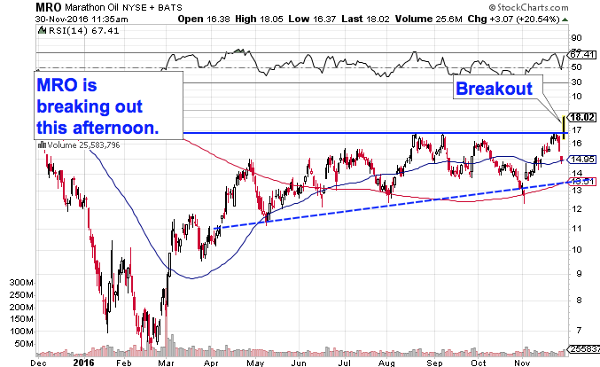 From here, ArcelorMittal could still have higher to run. Shares are hitting new 52-week highs this week, and momentum continues to look strong despite the size of the move we've seen in shares so far. If you're thinking about building a stake in ArcelorMittal, consider parking a protective stop on the other side of support down at $6.75.